Panels with A-grade and B-grade veneer faces are always sanded smooth in manufacture to fulfill the requirements of their intended end use – applications such as cabinets, shelving, furniture, built-ins, etc. Still other panels – APA Underlayment, APA Rated Sturd-I-Floor, APA C-D Plugged and APA C-C Plugged – require only touch-sanding for "sizing" to make the panel thickness more uniform. Sanded panels are fully sanded to a smooth surface while touch-sanded panels are sanded but perhaps not as uniformly as the sanded panels. It should be noted that when presented with moisture in the form of humidity, vapor or liquid, the grain of the wood is likely to raise and the surface become more uneven. 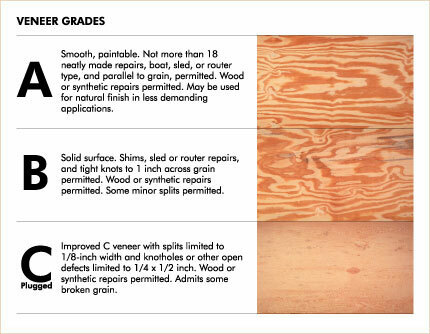 Download Sanded Plywood, Form K435, for more information. 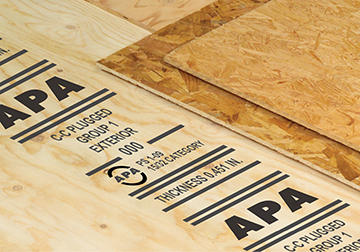 Sanded panels can be manufactured in a variety of ways – as plywood (cross-laminated wood veneer), as composites (veneer faces bonded to wood strand cores), or rarely as oriented strand board (OSB).